Lamu is a small island in Kenya that is fascinating and completely different from the rest of Kenya. It is a small but wonderful and peaceful place to be for a holiday. Especially the people living there they are so friendly than in any other place in the country. Moreover the Arabic culture, the traditional life, the splendid beaches and the fact that there are only a few cars on the island I liked the place from the very first moment. Lamu Island is a 7 mile long and 4 miles wide small spot in the Indian Ocean situated in the north of Kenya. The neighbouring islands which also belong to Lamu Archipelago are Manda Island (with the Airport), Pate and Kiwayu. The important villages on Lamu Island are Lamu Town (which is under protection of the UNESCO as world heritage site since the year 2001), Shela with its splendid and deserted 8 mile beach with dunes and Matondoni which is famous for the production of dhows (traditional boats). Lamu Island has only 30,000 inhabitants, which are mainly Muslims. In Lamu Town there are no main roads and so there are only narrow lanes, no wonder only very few cars exist, one tractor, a few motorbikes, countable bicycles and very many donkeys. These are the main means of transport of goods and services on the island. When you are walking through the narrow lanes you really get impressed when a herd of donkeys is on the way. You really feel like you are living in the past. Some tourist usually go to Lamu for a few days but they later realize it's a place they could stay for a long time without getting bored actually because it's a world by its own. Lamu is a tropical paradise, which is known by only few people. It has a quite interesting culture and the extra cost are unbeatable. Lamu Island is the oldest and the best-preserved settlement of the east Africa coast. The first settlers arrived in the 14th century. Later Portuguese sailors came to Lamu and it became a trading place for Arabic traders from Oman. Lamu did slave trade also which was abolished in 1907. The locals are so friendly and there's very little crime only. It's a world of its own although it's just a stone throw to the mainland. For this reason some actors spend their holiday in this island and also princess Caroline from Monaco has a property there. We recommend traveling to Lamu by plane. There are daily flights from Nairobi to Lamu. Currently, the cheapest airline is Jambojet with one-way fares from 5950 KES. Other airlines are Fly540, Air Kenya and Safarilink. Flights from Malindi to Lamu are daily with fares from 2950 KES one-way. For guests traveling from Mombasa, the easiest way is to take an express matatu to Malindi, get off at Malindi Airport and take a flight to Lamu. There are also daily buses from Mombasa or Malindi to Lamu. We offer to wait for our guests who do a pre-booking at JamboHouse at Manda Airport (or at the jetty in Mokowe for guests who are traveling by bus). On the 10 minutes boat ride to Lamu you get the first impression of Lamu Town. From the jetty it's only five minutes through narrow lanes to JamboHouse. Upon arrival we serve you a Welcome Drink on our rooftop terrace where you have a nice view of Lamu Town. Lamu Island is an ideal place to relax after a wildlife safari as the journey from Nairobi or Mombasa is easy. It has a fascinating swahili culture in Lamu Town (UNESCO World Heritage Site) and beautiful beaches with sand dunes in Shela (45 min by foot). Crime is very low in Lamu and the sun is shining almost all year round. It's an all year round destination with high season from December till mid April and in August. Temperatures during the day range between 28-34 degrees Celsius (82 to 93 degrees Fahrenheit) with the hottest temperatures in March and April. Rainy season starts around mid / end April till July. You will find detailed weather information at www.wetteronline.de. On Lamu Island itself we did not have any security problems since October 2011. Locals are still as friendly as usual. Myself, I live all year round in Lamu (apart from some holidays). 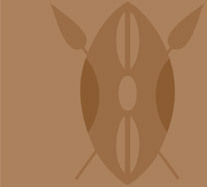 The official language in Kenya is English although most of the locals speak Swahili. You should take some precautions in Malaria although it's not such a big problem like any other place. In Lamu there is one of the most modern and well-equipped hospitals (financed by Saudi Arabia) of the Kenyan coast. In Lamu Town you find a lot of small shops, internet cafés, cell phones are working too (but who need it on a leisure trip to Lamu? ), offices of airlines and bus companies and also banks with international ATM's. In restaurants you get freshly prepared fish, rice, chicken and goat meat at very reasonable prices. For drinking there are soft drinks, freshly squeezed juices and beer. We gladly provide you with information to make your well-deserved holiday even more enjoyable. We reserve bus tickets, activities and could also help when you want to get extra services like Henna Tatto, massages or Swahili lessons. If you have any questions about traveling to Lamu or about your stay at JamboHouse please don't hesitate to ask us. As most of people here are Muslims it's good to respect their culture (and people still life traditional). One thing for example is that ladies should not walk in town in mini skirts or shorts. On the beach or on a boat trip ladies could wear a bikini (no problem).